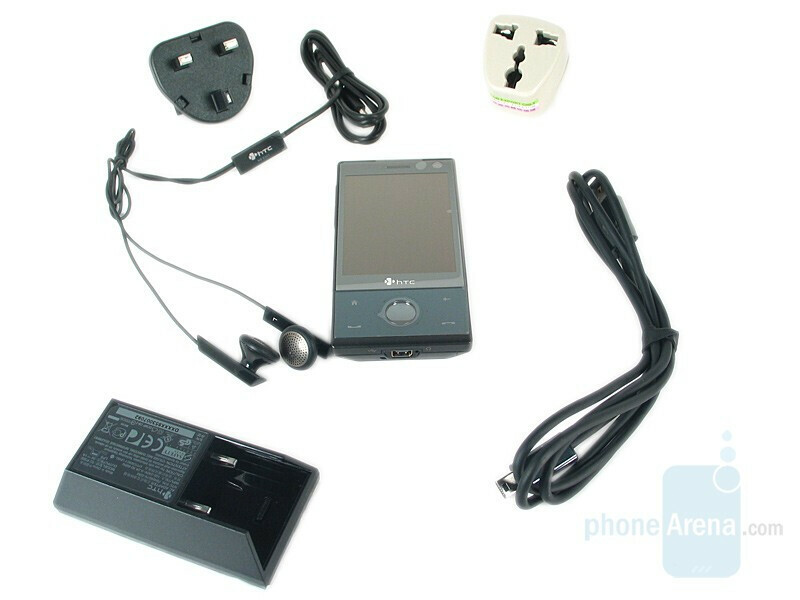 The HTC Touch was the first real competition the iPhone faced, even if it didn’t necessarily set out to be. HTC was surely trying to capitalize on the popularity of Apple’s all-touch device, but Windows Mobile is a more open though much clunkier UI than OS X, and ultimately the devices were really in a different class. Sure, TouchFLO gave a finger-friendly skin to the Touch, but in reality the iPhone was built from the ground-up as a consumer friendly, media-oriented device whereas the Touch was a Windows Mobile business device that happened to lose the keyboard and get some fancy software. Don’t get us wrong, we loved the Touch, but it just wasn’t iPhone material. Now comes the second generation, dubbed the Touch Diamond, and it’s obvious that HTC is ready to take on the iPhone properly this time around. Gone is the gimmicky TouchFLO, replaced by a completely overhauled and practical TouchFLO 3D. Web surfing is handled beautifully by Opera Mobile 9.5 instead of Mobile IE; 7.2Mbit/s HSDPA and Wi-Fi makes the experience that much better. Users can browse photo albums and listen to their music directly from the homescreen. Little things, such as resting the phone on its face to trigger silent mode or the phone waking up when the stylus is removed, reaffirm HTC CFO Cheng Hui-min’s description as "the most important product for HTC this year." The Touch Diamond is a beautifully crafted phone. 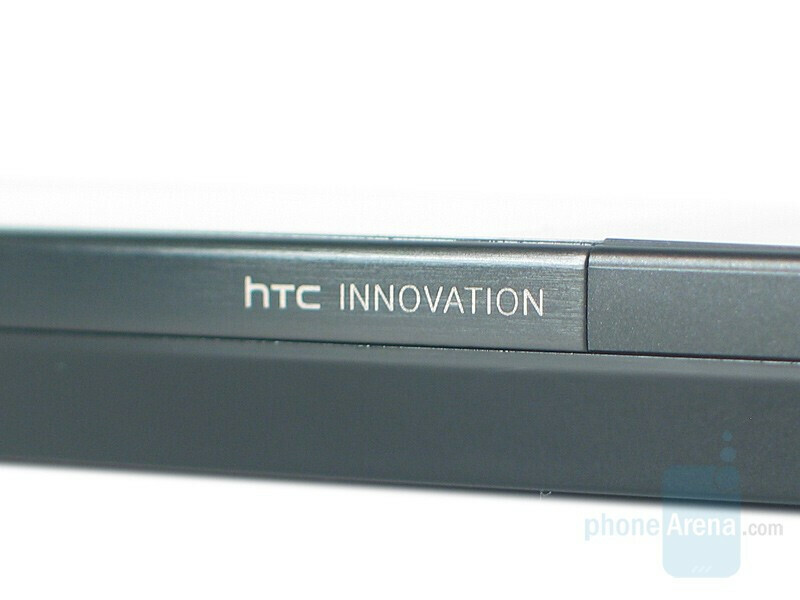 HTC has obviously paid attention to every little detail, and the result is amazing. The first time we unboxed the Touch we were astonished at just how small it was, yet HTC has managed to go even smaller with the Diamond all while packing in worlds of new features. The Diamond is a bit taller than the original Touch, but is thinner and noticeably narrower. 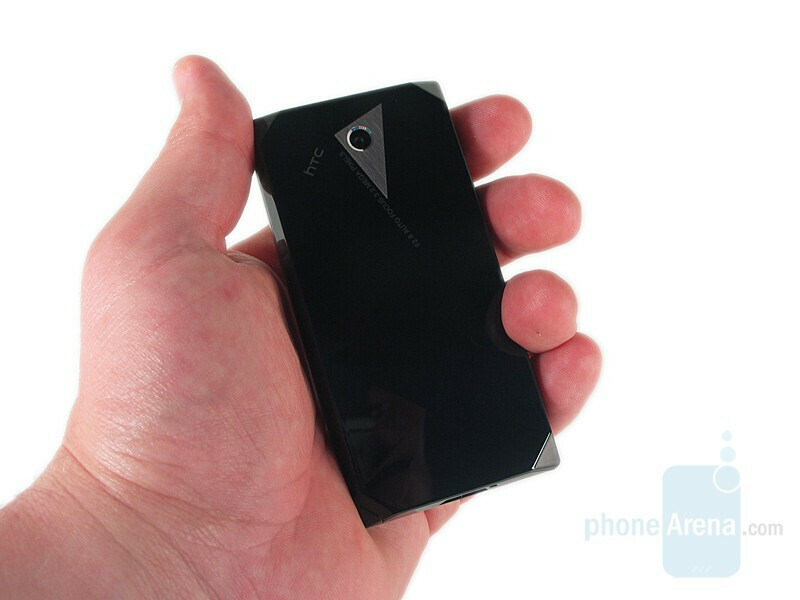 You can compare the HTC Touch Diamond with many other phones using the Size Visualization Tool. The 2.8” touchscreen monopolizes most of the Diamond’s real estate. It is resistive as opposed to capacitive, meaning that it will work with a stylus and even when the user is wearing gloves. It is responsive and quick, allowing for a buttery smooth TouchFLO 3D interface. The screen’s VGA resolution means everything is crisp as can be. It auto-adjusts the backlight based on the lighting conditions (the user can override this) and we had no problems viewing the screen even in direct sunlight. It’s downright beautiful. 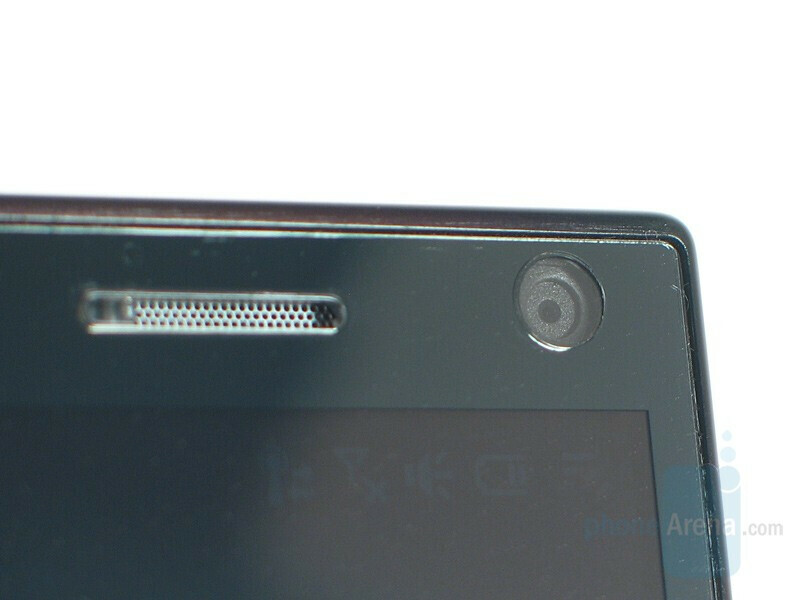 Centered at the top of the screen is the earpiece, and off to the right is the front-facing VGA secondary camera. Below the display are the navigation keys. There are four buttons situated at the corners of this area, and moving clockwise from top left you will find Home, Back, End and Send. In the middle is the circular directional pad. 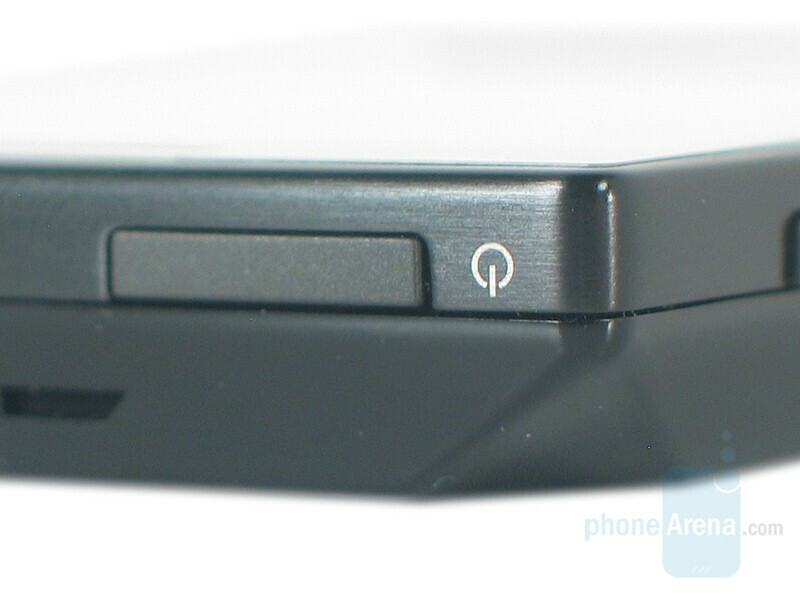 The buttons are a mix of physical and capacitive; most can be pressed, but the center button is also capacitive (which is used for certain things like the camera’s autofocus) and running your finger around the outside of the d-pad acts as an iPod-esque scroll wheel for media playback control. In addition to the scroll, you can click left, right, up and down in that area, just like a traditional d-pad. With the exception of the center of the d-pad the buttons all lie flush and give the appearance that they may be touch-sensitive, but HTC has chosen wisely in making them physical buttons. The entire front is housed in a dark, silvery reflective finish. The Diamond’s gunmetal frame is brushed stainless steel, which rings the outside of the phone and contributes to its fantastic weight. 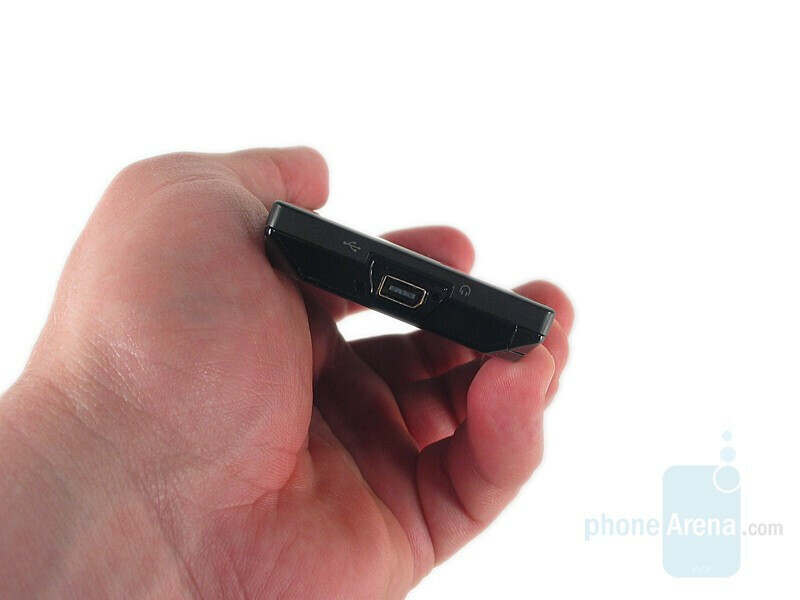 You will only find two physical keys around the phone; on the left is the volume rocker and up top is the power button. They are both long and flat, but are raised and offer enough travel to ensure that you have pressed the button. 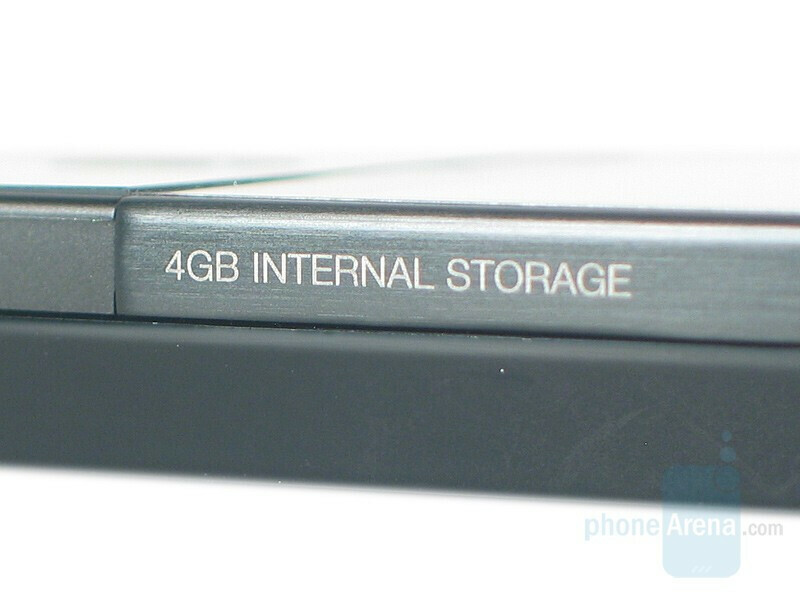 Each side has an etched phrase, “HTC INNOVATION” on the left and “4GB INTERNAL STORAGE” on the right. The power button on top sits to the left and in the center is the Diamond’s single speaker, which is loud enough and does not distort at high volumes. 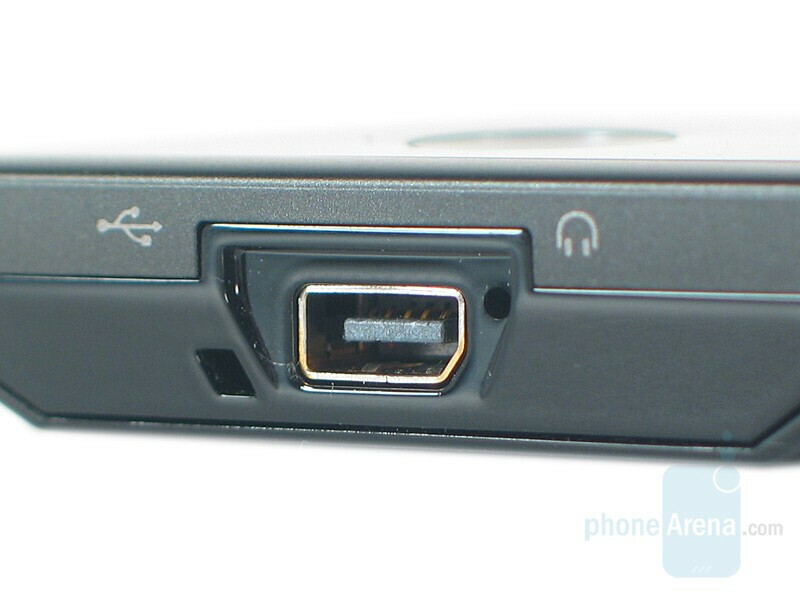 The bottom simply has the miniUSB port, which serves as the charging/data/headset jack. The entire back of the phone is the battery cover. True to its name, the cover is faceted like a diamond. 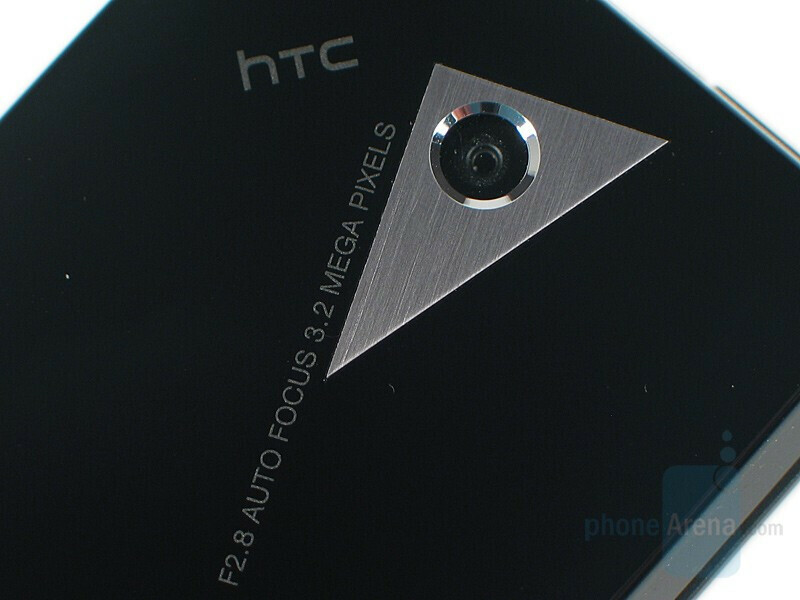 Near the top is the 3.2 megapixel, autofocus camera. 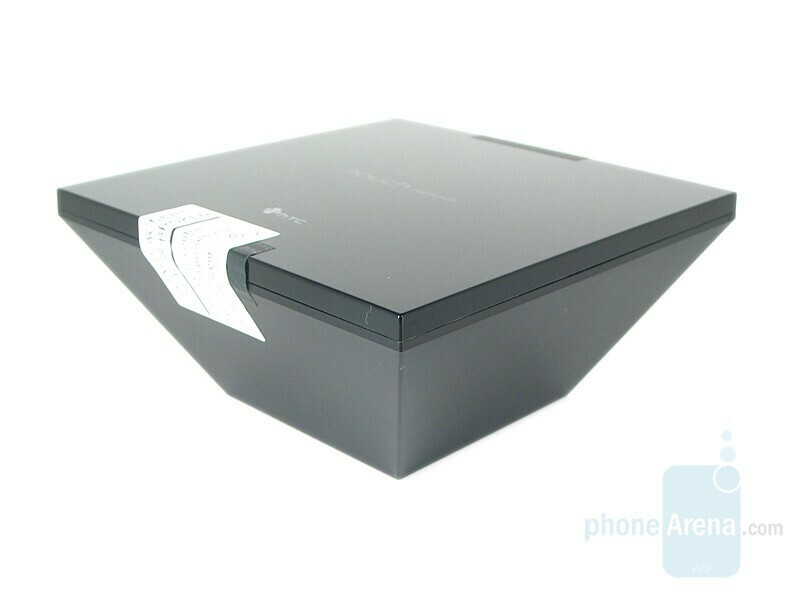 The angular facet it sits in is bright, brushed stainless steel whereas the rest of the cover is piano black plastic. 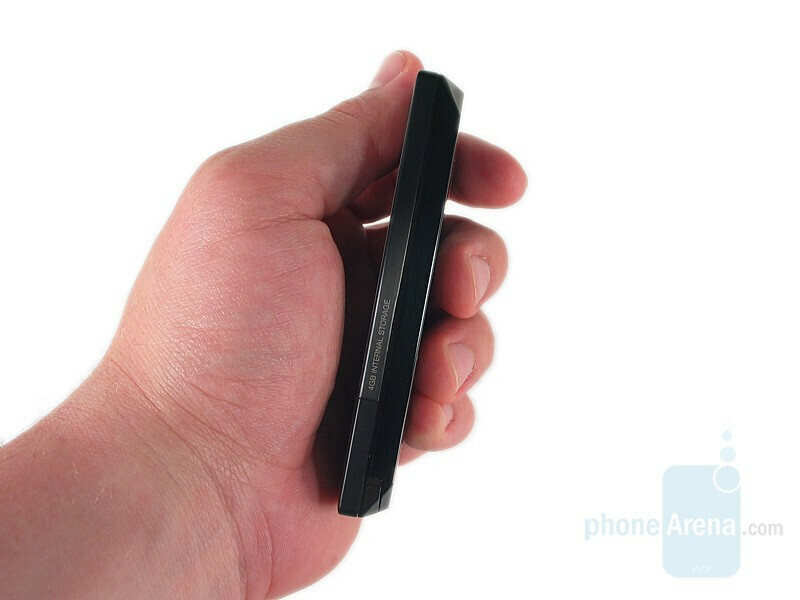 Simply slide the cover up to reveal the battery and SIM slot. 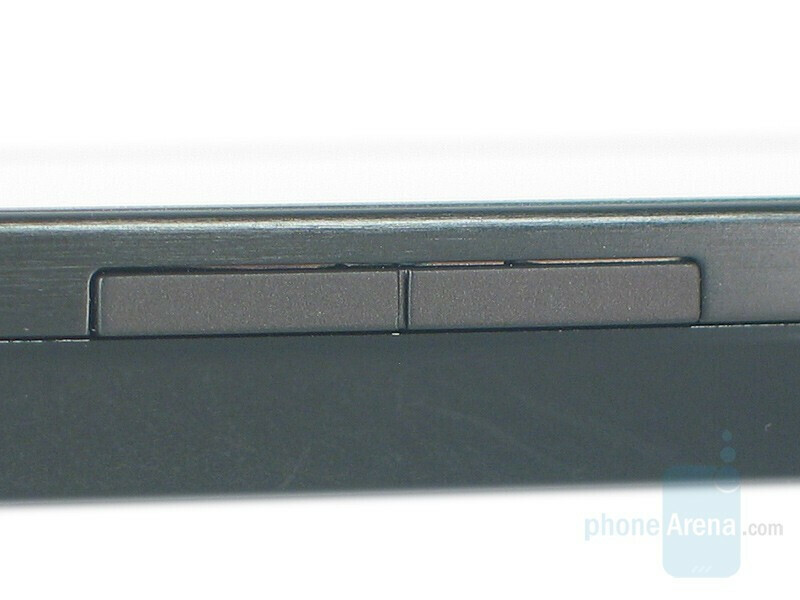 At the bottom left is the stylus, which is held firmly in place by an internal magnet. 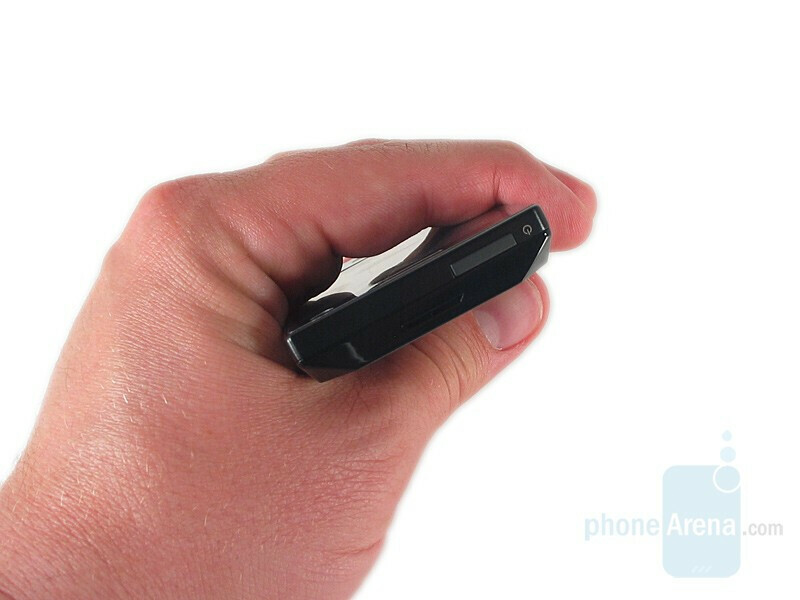 If the phone is asleep and you remove the stylus it will wake up, anticipating that you want to use it. It’s hard to find fault with the Diamond’s design. The size and weight make for a perfect in-hand feel. The construction is solid, and the stainless steel frame give a reassuring weight to the device. The dark silver finish and brushed steel accents give the Diamond an understated air of elegance. We could take or leave the faceted back, but you have to admit that it gives the Diamond some personality and the pattern is growing on us. About the only thing we can find fault with is the fingerprints; it seems that even thinking about the phone leaves prints all over. There is a pouch that purports to clean the phone when slipped in and out, but as it’s not an included accessory we were not able to test it out. That’s really the only complaint we could come up with though, the Touch Diamond is a wonderfully crafted piece of hardware. AWESOME! At least they put in a browser by default that is not the standard IE. Pocket IE is great for tiny pages, but is woefully slow and renders complex pages well. Heavy browsing on Pocket IE was painful and cumbersome. Browsing on the iPhone by comparison was a dream, and that is one reason why iPhone is so popular. Give it a good browser, and it will be a good iPhone competitor ... not until then. I absolutely hate WM just because of the browser, and the alternatives for it render better, but still a clunky experience when compared to iPhone. The new opera may change that. Also, why resistive touchscreen? Capacitive is much better suited for finger use. The poor performance on AT&T is most likely due to the devices lack of 850mhz. I would imagine you were in a 850 area for AT&T, and often any 1900mhz isn't built out for solid coverage. iPhone is also an expensive one, but everybody is getting one and even jailbrakes it! 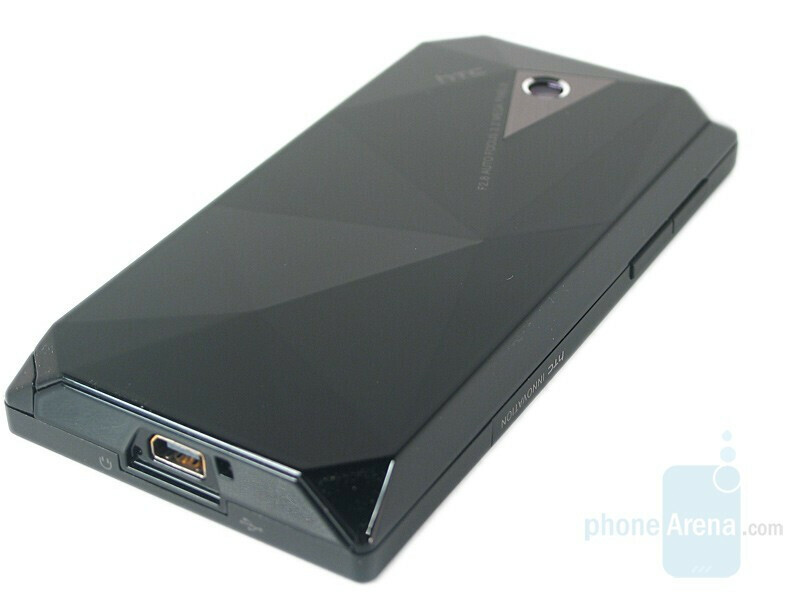 Its the same for the Diamond: with that design and interface it is targeted to both highend/business users and to the Joe who wants iPhone-like touch-thing. how do I get this UI on my touch? What about GPS? Is it any good? do you need to be connected to the internet for the weather updates to work? To answer #12 comment. Yes, how else are you gonna get updates. Quiksilver meter and worker ants in the phone. That's how they did it in the AAAWWWLD days. Err... your first paragraph put me off this review. The original Htc Touch came out 4 months before the iPhone, so it was hardly trying to capitalise on the popularity of that phone! because the iphone was announce before the touch so the touch was based on what apple was to release maybe? anyone ever realize that apple wasnt the original creator of touch screen phones. why do you people always have to push the fact that every touch type phone is to compete with the iphone. i know some phones look way too much like the iphone, but that doesnt always mean that every new touch screen phone was made to compete. that doess not look like the best internet on a phone at all. I did want to mention this but when I used my brother's ipod touch, the internet browsing was a lot smoother. When moving through a page, everything seems to flow with hyour touch.But everything seems so slow to me in the touch. When he flips through albums and pictures, the touch seems so unresponsive. Maybe its just that the guy doesn't really know how to use the phone that well. But what I like is how the very bottom bar looks very smooth and slides with ease wehn sliding through the menu. That's the only smooth and responsive thign that I've seen on the phone so far. Probably a dumb question, but I read the review and didn't seem to see this answered. Does Diamond have 3G connectivity? If not, how would the internet speeds compare with the 3G connectivity coming out for the iPhone 3G? Also kind of off topic, but the ability to sync with Exchange, use Word and Excel are big sticking points for me - are all 3 of these options available on the iPhone 3G or will I have to get a phone like the Diamond with Windows Mobile? Thanks again. I'm torn between the iPhone 3G, the Diamond and the Touch Pro so I'm not sure which way to go yet. HSDPA means actually 3.5G, so the answer is yes. Actually iPhone 3G seems to support only lower speed 3.6 Mbps HSDPA while Touch Diamond offers 7.2 Mbps. However, probably this is not very relevant since in mobile phones, CPU/graphical processing power is becoming nowadays more critical than download speed. In terms of Word/Excel, the big differentiator between iPhone and Touch Diamond is the editing capability. Exchange should work on both platforms, still iPhone 3G functionality needs to be assessed. My advice would be: if you want a small/compact device go with Touch Diamond, if you absolutely need a keyboard wait for the Touch Pro, or go for the iPhone 3G if you like the iPhone interface,prefer more storage space for music and don't care about camera and size. If reception was as poor as indicated below...how did this phone get a 10 for connectivity ?? The reception, on the other hand, wasn’t so hot. We tried both an AT&T and T-Mobile but had issues with in-building reception. With AT&T we could barely, and often couldn’t, hold a signal even outdoors in places where we know AT&T works well. Furthermore, some users may not be able to get EDGE data with AT&T. T-Mobile was a decidedly better experience, though still not great in areas such as office buildings or malls. For now we are forced to use the 1900Mhz band, which does not penetrate buildings as well as 850. This could have played a factor in our reception issues so we will reserve our final judgment for when the US version comes out. For now, however, importers beware! 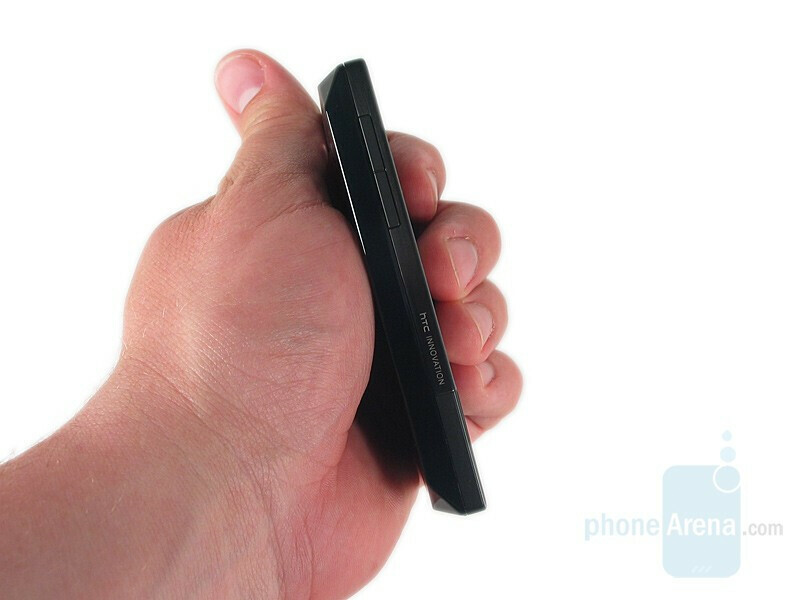 If verizon got this phone, it would be hilarious if they put their own interface on it. Honestly i think Sprint should of focused more attention on HTC products much more than on the Garbage INSTINCT You cant even customize anything on the phone, but all i can say is the Diamond and the Rafael is going to be some Awesome phones!!! i plan to buy this touch diamond. is ti really that slow? and gps can trust that gps if i go somwhere and whose maps it is using? how long baterry can handle in stand by mode? how much is it costs right now? a lot of questions i hope somebody will answer.